Although our motto is Service Above Self, there are many benefits to being a Rotarian. 1. Professional Networking: Rotary is a forum for community leaders, with its members holding key positions in business, industry, the professions, the arts, government and religion. They make decisions, influence policies and take actions that shape our community and beyond. 2. The Opportunity to Serve: Rotarians provide service at both the community and international levels. Service programs address health care needs, hunger and poverty, illiteracy, disaster relief and environmental cleanups, to name a few. Members experience the fulfilment that comes from giving back to the community. 4. Friendship: Fellowship was a primary reason Rotary was started in 1905, and it remains a major attraction. With more than 30,000 Rotary Clubs in over 160 countries, Rotarians have friends wherever they go. Rotary helps to build community as well as enduring friendships. 5. Cultural Diversity: Rotary International is an association of local clubs in many countries. Clubs are open to members of every ethnic group, political persuasion, language, and religious belief. Rotary Clubs contain a cross-section of the world’s leaders. They practice and promote tolerance. 6. Good Citizenship: Membership in Rotary encourages active citizenship. Weekly Rotary club programs keep members informed about what is taking place in the community, nation, and world. Rotary’s expansive network of clubs and programs provides extensive opportunities for service and interchange. 7. World Understanding: Rotary members gain an understanding of humanitarian issues and have a significant impact on them through international service projects and exchange programs of Rotary International and its Foundation. The promotion of peace is one of Rotary’s highest objectives. 8. Entertainment: Every Rotary Club and district hosts parties and activities that offer diversion from one’s personal and business life. Conferences, conventions, assemblies and social events provide entertainment as well as Rotary information, education and service. 9. Family Foundations: Rotary sponsors some of the world’s largest youth exchange and educational exchange and scholarship programs. 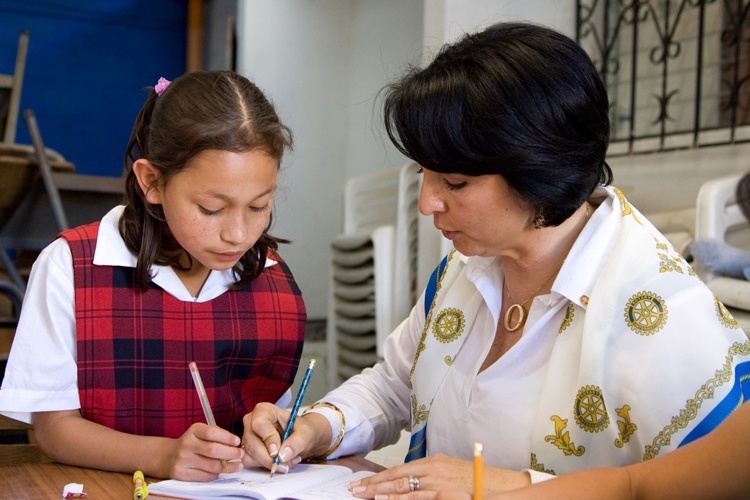 Rotary Clubs provide innovative training opportunities and mentoring for future leaders. They involve family members in a wide range of social and service activities. 10. Ethical Environment: Rotarians practice a 4-Way Test that measures words and actions by their truthfulness, fairness, goodwill, and benefit to all. Encouraging high ethical standards in one’s profession and respect for all worthy vocations has been a hallmark of Rotary from its earliest days.